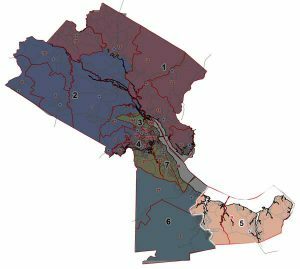 Today’s installment is Craven County Commissioners District 5, which encompasses the southeastern end of Craven County, including MCAS Cherry Point and part of the town of Havelock. This district is currently represented by Democrat Theron McCabe, who is being challenged in the Democratic primary by Rufus Carter, Jr. The winner of the Democratic primary will be unopposed in November’s general election. 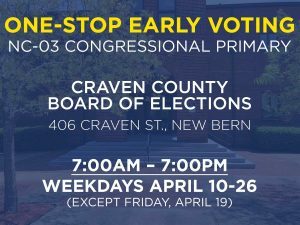 One-Stop Early Voting for the 2018 primary starts April 19, with Election Day on May 8. Cast your vote early, and bring a family member, friend, or neighbor with you so they can vote too! Rufus Carter, Jr. is a native of Havelock, North Carolina born in a small-town called Harlowe with a population of 3,920 residents. 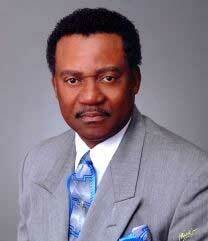 He is the second oldest of six children of Mr. and Mrs. Rufus Carter Sr. He is a graduate of Havelock High School Class of 1978. He has four beautiful children and four lovely grandchildren. On September 7, 1978, Rufus enlisted in the United Stated Army Reserves and attended Basic Combat Training at Fort Jackson, South Carolina. He then transferred to Fort Eustis, Virginia where he received training at the US Army Transportation Center. His Military Occupation Specialty was a Light-Wheel Vehicle Mechanic, which is MOS code 63B10. He was assigned to the 824 Transportation Unit in Morehead City, North Carolina until being discharged with honors on August 20, 1984. After leaving the US Army he started working for the (DOT) Department of Transportation in 1986 in Newport, North Carolina as a Heavy Equipment Operator. He held the position for 9 years as a seasonal worker. The job gave him the ability to learn how construction work is done and to work effectively in addressing the public about their concerns. While performing his work at the Department of Transportation (DOT) he was offered a job working for an Information Technology Company called American Systems Corporation (ASC). Rufus is very active in the community and offers his full support for those who need their concerns heard and addressed. He has a passion for helping citizens with everyday challenges they face in the community. He has found a community that embraces him, citizenship that is meaningful and the direction he had been seeking. He has also discovered how his own improbable story fits into the hearts of others who share the same dream he does. In 2004, Rufus stepped forward into the political field to fulfill those dreams. His goal and dream is to run for office and fill the seat as Craven County’s Commissioner of District #5 so that we can rebuild our community and have the things that we need: EMS and Paramedics added into our fire service substation, after-school programs and summer programs for our youth, and other activities for our seniors that district 5 needs. Commissioner Theron McCabe, a native of Craven County, is the son of the late Rev. Roy and Bertha McCabe. 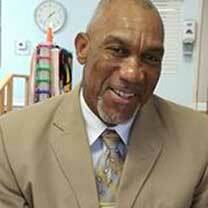 He grew up in the Harlowe community and graduated from Havelock High School in 1967. After high school, he moved to Brooklyn, New York where he attended the Police Academy for six months, after graduating as a uniformed police officer with the New York City Housing Authority Police Department and worked with the New York City Police Department. He was later promoted to detective, assigned to the Drug Enforcement Administration and Alcohol, Tobacco and Firearms Division. Later assigned to Manhattan Narcotics Unit. Following his retirement in 1995, Commissioner McCabe returned to Craven County, North Carolina and became active in the Harlowe community. He was elected to Board of Commissioners in 2006. Some of his priorities for Craven County are: To support and enhance the County’s education system, enrichment of recreational outlets for County youth, improve public safety and emergency services for all citizens, improve County infrastructure, including better sewer, drainage, highways and secondary roads as well as in the City of Havelock.